Map showing the route of the twin-tube Ceneri Base Tunnel (CBT) under construction in Switzerland's Canton Ticino. The base tunnel will stretch for approximately 15.4km between Vigana and Vezia. Set to become the second biggest railway tunnel in Switzerland after the Gotthard Base Tunnel, the twin-tube Ceneri Base tunnel (CBT) is currently under construction in the canton of Ticino. The tunnel is being constructed as part of the New Rail Link through the Alps (NRLA) project, which is being developed by AlpTransit Gotthard (ATG), a wholly owned subsidiary of Swiss Federal Railways. The project was approved by the Swiss Federal Council in July 2001. It will significantly reduce the travel time between Lugano and Bellinzona while providing a flat route for freight trains. The CBT and the Gotthard tunnel will offer a faster connection between Zurich and Milan. The tunnel is expected to be operational by December 2020. The estimated investment for the project is Sfr2.4bn ($2.58bn). The length of the entire tunnel and the passage system will be 39.78km, stretching between Vigana and Vezia. It will include two single-track east and west tubes that will be 40m apart and connected by cross passages every 325m. The east tube is 15.45km-long and the west tube is 15.28km-long. A ventilation centre and logistic area were built at Sigirino. Conventional drilling and blasting was used to build 37.49km of the tunnel, while the remaining was bored by a tunnel boring machine (TBM). The tunnel construction officially began in June 2006. Breakthrough in the west tube between Sigirino and Vezia and in the east tube between Sigirino and Vezia was achieved in March 2015. Zurich is Switzerland’s largest city, and also has one of Europe’s greatest concentration of rail infrastructure. The 37.35km excavation of access passages and the tunnels was completed by May 2015. Final breakthrough of the tunnel was achieved in January 2016. The installation of track, catenary, electric power supply cables, telecommunication systems, radio systems, automation systems, overhead conductor tractive and general electric-power supply, safety and control systems began in 2017. The excavation work on both east and west tubes of the tunnel began in 2007. Excavation of a 2.4km-long (1.5 miles) adit tunnel was completed after ten months of boring in November 2008. It involved excavation of 160,000m³ of hard rock by using 30 cutter rings with advance rates of 18.5m a day. The Main Beam TBM from Robbins Company was used for boring the adit tunnel using 483mm cutters. The TBM has a length of 160m, including a back-up train, and weighs 1,160t. It was refurbished and its cutterhead diameter increased from 7.6m to 9.7m to improve the boring rate. It is propelled by ten motors that develop a driving power of 3,750kW. 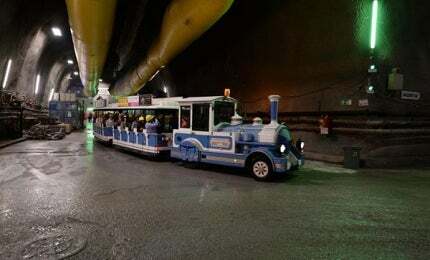 In April 2007, Alp Transit Gotthard awarded Consorzio Monte Ceneri (CMC) JV, a consortium of CSC, Lugano, Frutiger, Thun, Rothpletz, Lienhard + Cie, and Aarau, a Sfr85m ($91.52m) contract for the first underground construction of the tunnel. CMC placed a contract with the Robbins Company for a 9.7m (31.8ft) main beam TBM to bore the adit tunnel. Consorzio Condotte Cossi consortium comprising Società Italiana per Condotte d’Acqua, Cossi and Cossi SA Lugano was awarded a Sfr987m ($1.6bn) construction contract in June 2009. The contractual scope includes the construction of two 15.4km-long single-track tunnels northwards and southwards from the intermediate heading at Sigirino. SIEMAG Tecberg was awarded a Sfr18m ($19.53m) contract to provide hoisting equipment for two 800m-deep hoistways at Sedrun in November 2011. Holcim was contracted to supply material, including cement aggregates and RMX, for the tunnel construction. The Mons Ceneris Consortium, led by Mancini&Marti, was awarded a Sfr96m ($103.36m) contract to provide railway track and logistics for the tunnel, in August 2013. The Cablex-led CPC Consortium won a Sfr129m ($138.89m) railway systems and overall tunnel co-ordination services contract in August 2013. Tunnel Control Systems was contracted to perform planning, supply, installation and commissioning of the tunnel control systems. The overall system is controlled from the control centre (South) at Pollegio.